The story of Robin Hood is one that will always be relevant, which may be why it has endured so long and inspired so many adaptations: from more serious films like the Russell Crowe version, to Men in Tights. 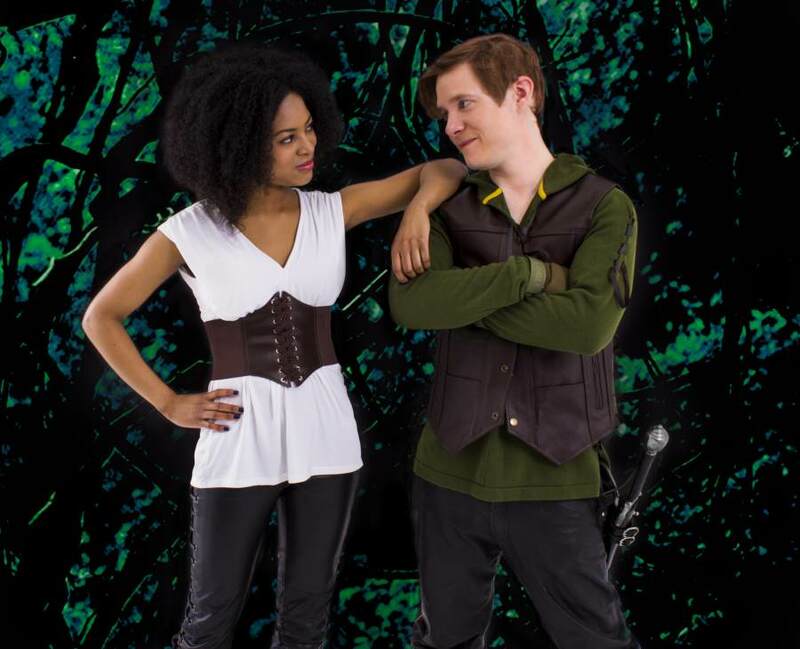 Larry Blamire's Robin Hood, directed by Christina Sheehan at the John DeSotelle Acting Studio, is more in the vein of the latter, though it has its serious moments, too - just not many of them. In a (very) intimate setting (as in Allie-a-Dale may tell you knock-knock jokes during intermission), this production features a host of energetic players acting out the Robin Hood story yet again in an aesthetic that combines the medieval and modern worlds. At times, this approach works beautifully. At others, it flounders a bit. But above all, this is a fun and quirky (if not 100% successful) retelling of the legend of Robin Hood and his Merry Men. As Robin, Jonathan Emerson pulls off a character who's heroic but a bit scruffy (and far from humble). He delivers a good rousing speech to the Merry Men (most of whom are actually women), and his romantic scenes with Maid Marian succeed in being cute and tender. Ellie Gossage is adorably quirky as Will Scarlet, Robin's right-hand (wo)man. And Cheney Morgan is sufficiently angsty as the Sheriff of Nottingham. However, I found Kristin Bellamarie's portrayal of Eleanor of Aquitaine (King John's mother) the best performance in the show. Her queenly demeanor and cool calculating manner in the face of her son's and the Sheriff's blundering mark her as the true power behind the throne, and possibly the best actor in the bunch. Admittedly, though, Isaac Scranton's Guy of Gisborne is a close second; and if I were several years younger I'm pretty sure I'd be terrified of him. Sarah Elizabeth Grace also gives a small but hilarious performance as the Sheriff's underappreciated secretary. Blamire's script contains moments that are downright hilarious, and several very well-crafted lines. At times, though, the script feels like it's trying to straddle a region somewhere between Shakespeare and Monty Python - which is brilliant if when it's pulled off, though it doesn't always work. For example, the intense death scenes clash a bit with the lighthearted tone of the rest of the piece. Where the production succeeds most thoroughly is in its delightfully imaginative costumes, which do actually succeed in straddling the line between the medieval age and modernity. Robin's green hoodie and vest are perfect for a character that's as relevant today as in the 15th century. And the sunglasses worn by the Sheriff's Foresters are a fun touch. Though it waffles a bit in the middle, Robin Hood - as most adaptations of the legend do - ends satisfactorily. The villains get their just desserts, and the heroes live happily ever after (except for those who are dead). I've now decided we need a Broadway musical about Robin Hood (and I don't mean Men in Tights). Let's make it happen.